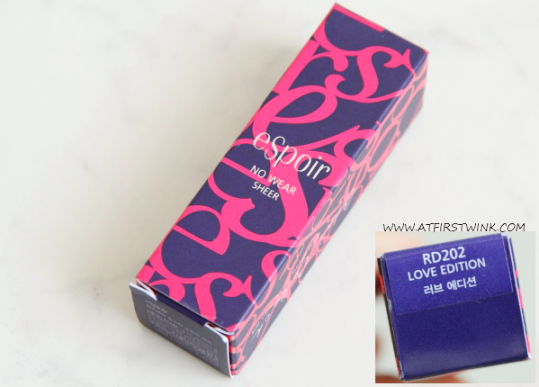 After yesterday's review of the eSpoir no wear touch lipstick in the color PK009, I have another eSpoir lipstick to show you. This time, it is one from the no wear sheer range. As the name suggests, it is a sheer lipstick. 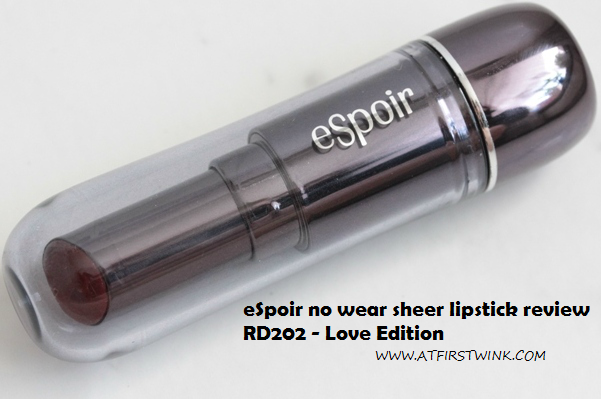 I really like sheer and glossy lipsticks, so I anticipated this eSpoir no wear sheer lipstick in the color RD202- Love Edition a lot. Different from the eSpoir lipsticks in the no wear touch range, it doesn't have the cute metallic pink casing, but a chic, dark grey, metallic one instead. The paper box on the other hand, is the same as the other eSpoir lip products that I bought. The lipstick bullet looks very frightening dark, blood red, but when swatched, you can see that the color is a very pretty berry red. It reminds me somewhat of the Clinique Almost lipstick in the color Black Honey, which is a bestseller and an universally flattering shade. 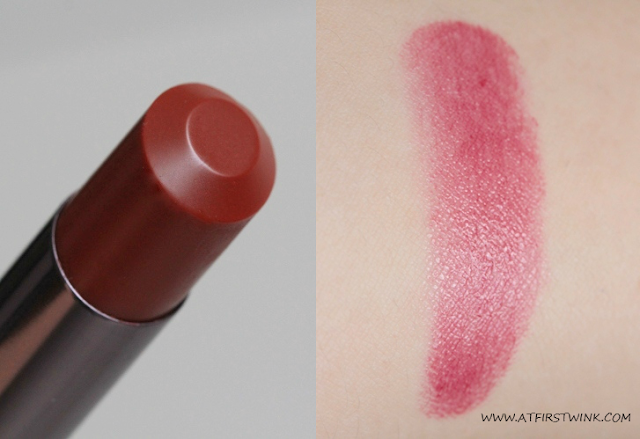 The eSpoir lipstick has a very nice berry scent with a hint of sourness that doesn't linger on the lips. The color pay-off is excellent, as I only needed one coat to get a lot of color (as seen in the picture). Compared to the Etude House Dear my jelly lips lipsticks that are also sheer lipsticks, this lipstick provides a lot more color without needing any layering. The texture is slightly stickier and you need to use a bit more strength to apply it on the lips, but that is the reason why it has such a good durability and it feels just as comfortable on the lips as the Etude House lipsticks.